YMCA volunteers provided valuable assistance with policies, programs, and activities. Each of our volunteers’ selflessness and willingness to roll up their sleeves to give back helps improve the lives of thousands of kids, adults, and families. 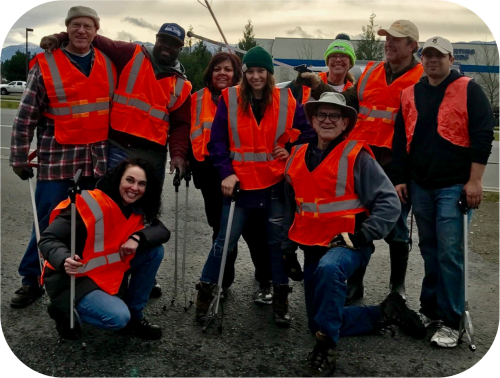 Volunteers assist with the Adopt A Highway project along Highway 101 at Milepost 261.25 and 263.5 with Olympic Peninsula YMCA staff 4 times a year. 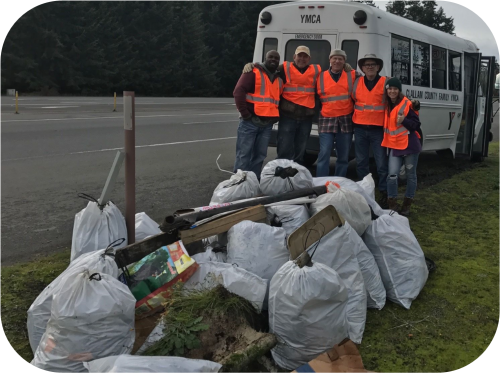 Volunteers will receive bags, reflective vests, gloves and directions to beautify along the road with the YMCA by picking up trash, recycling and any debris along the road and leaving it for Clallam County to pick up at a later date. Must be 18 year of age or older to volunteer for Adopt A Highway. Meet us at the YMCA of Port Angeles at 7:45 am to bus to the location or meet us at the PUD parking lot at 8:00 am. Would you like to join us in keeping our peninsula beautiful? Please watch the safety video before arriving at the clean up. Olympic Peninsula YMCA Volunteers picked up 40 bags of trash on less then a 2 mile stretch December 2016.